That’s right, things are getting fancy & cultural up at Delish Thoughts. 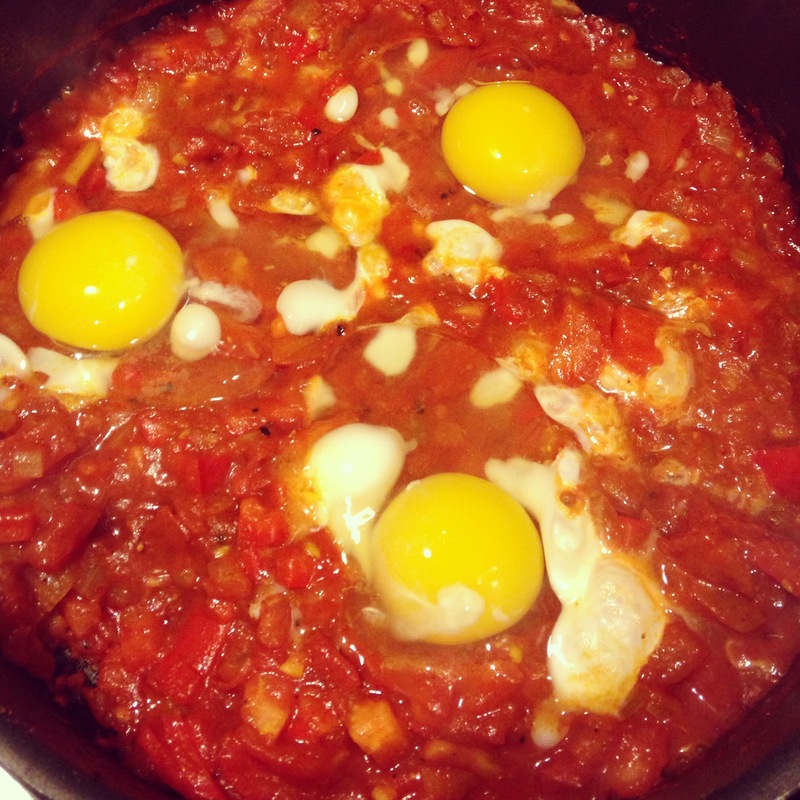 I was just browsing through recipes online when I randomly saw a photo of eggs cooked in tomato sauce. I became curious and learned that it is a Middle Eastern dish called shakshuka. It’s basically eggs poached in a sauce of tomatoes, onions, bell peppers & spices. It’s really easy to make.. I can give you 3 words to describe the process: chop, stir & poach. One issue I had was that I thought I had cayenne pepper but didn’t and it is definitely needed for this dish.. overall still good but it needed a kick. Serve with some toasted bread to dip into the sauce. Add the bell pepper, sauté for 5-7 minutes over medium until softened. 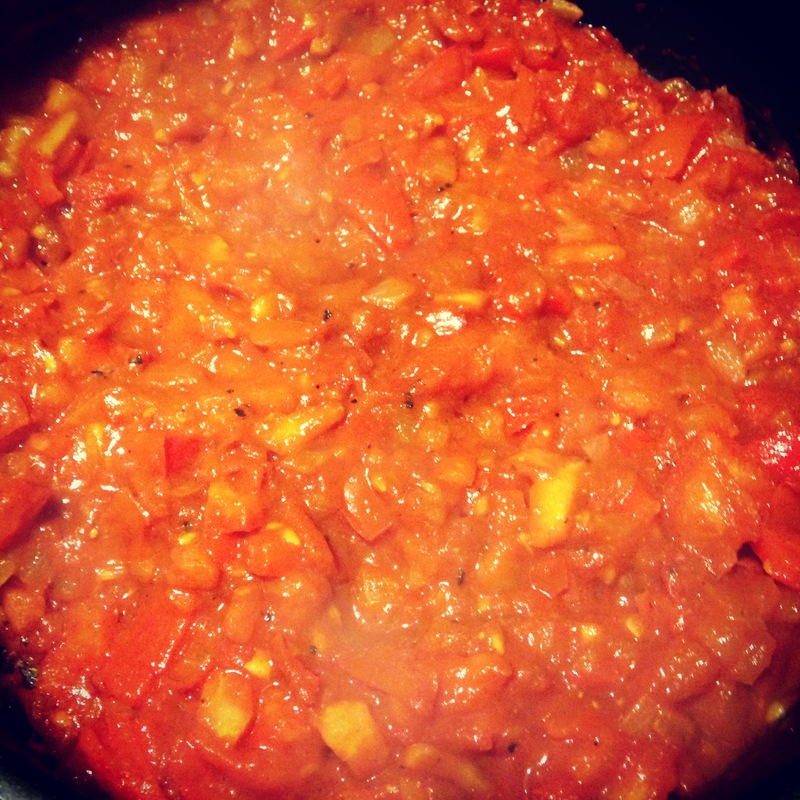 Add tomatoes and tomato paste to pan, stir till blended. Add spices and sugar, stir well, and allow mixture to simmer over medium heat for 5-7 minutes till it starts to reduce. At this point, you can taste the mixture and spice it according to your preferences. Add salt and pepper to taste, more sugar for a sweeter sauce, or more cayenne pepper for a spicier shakshuka (be careful with the cayenne… it is extremely spicy!). Crack the eggs, one at a time, directly over the tomato mixture, making sure to space them evenly over the sauce. I usually place 4-5 eggs around the outer edge and 1 in the center. The eggs will cook “over easy” style on top of the tomato sauce. Cover the pan. Allow mixture to simmer for 10-15 minutes, or until the eggs are cooked and the sauce has slightly reduced. Keep an eye on the skillet to make sure that the sauce doesn’t reduce too much, which can lead to burning. 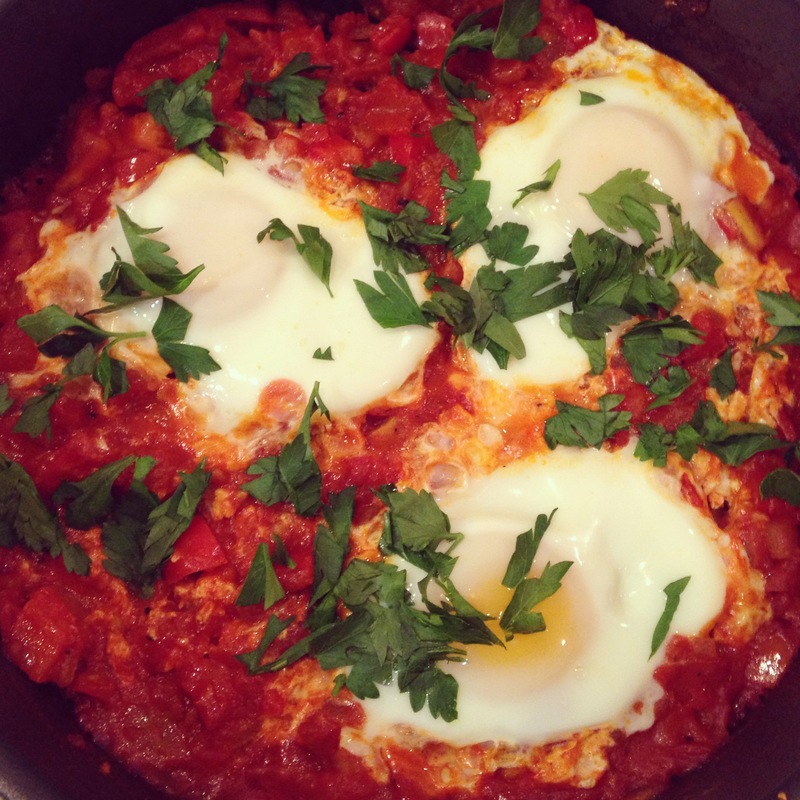 Some people prefer their shakshuka eggs more runny. If this is your preference, let the sauce reduce for a few minutes before cracking the eggs on top– then, cover the pan and cook the eggs to taste. Garnish with the chopped parsley, if desired. 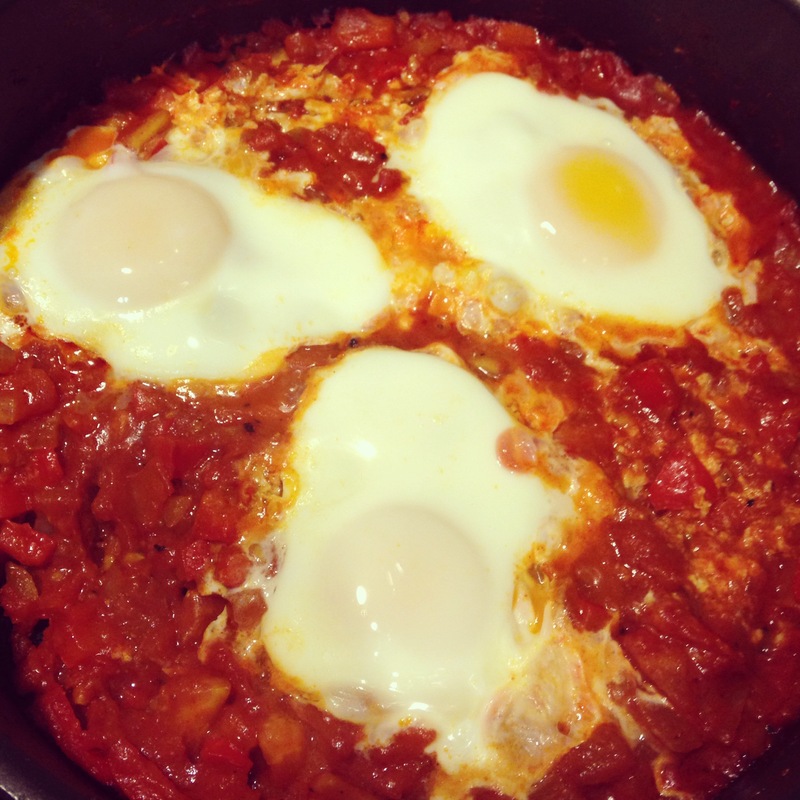 Shakshuka can be eaten for breakfast, lunch, or dinner. For breakfast, serve with warm crusty bread or pita that can be dipped into the sauce (if you’re gluten-intolerant, skip the bread). For dinner, serve with a green side salad for a light, easy meal. Previous Postwould you say your pesto is the besto?